The Treasury Department recently released their April 2013 "Major Foreign Holders of Treasury Securities" report. According to the Treasury Department, foreign entities reportedly held $5.6708 trillion in US debt as of April/2013, up $30.4 billion from the month before. Over the past 12 months, foreign holdings of US debt have increased by roughly $450 billion, from $5.217 trillion to $5.6708 trillion. 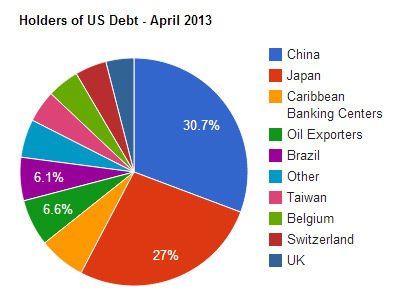 China's portfolio of US debt has increased 8.63% over the past 12 months, while Japan's has increased by 1.14%.